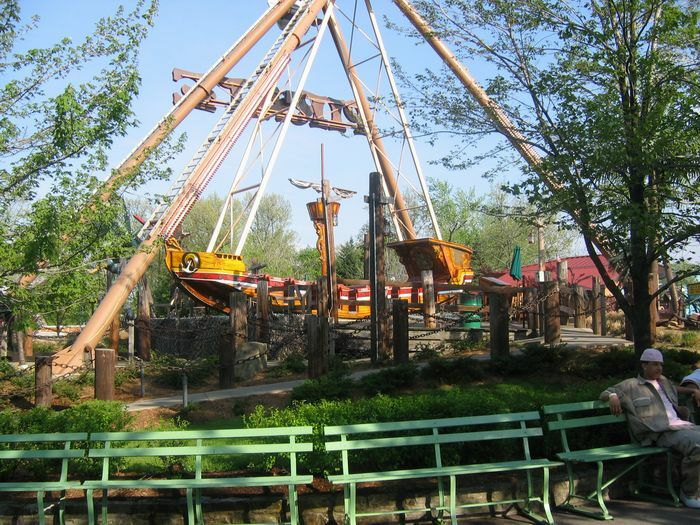 The Pirate is a pendulum flat ride. It is fast, fun, rerideable, it has a large capacity, and a long duration. Good swinging ship. The boat looks good and the ride had lots of air on the ends. Kennywood also ran a long cycle on this. Only negative is how sensations were non-existant on this one in my opinion. An average flat ride with some mediocre airtime and a decent cycle. I liked what I could see of the themeing at night. This was a really good swinging ship. The cycle was long, and the line was short, so we were able to ride in the very back and catch some great air. One of the best pirate ships I have been on, even without the crazy pirate voices. Jay, you reading? Ive always preferred Flying Carpet, but this thrillride is still a very thrilling attraction at Kennywood. This is the only Swing Ship Ive been on, but from what Ive heard, the wheel underneath the ship makes it go faster or higher or something like that. Not sure though. But the surrounding Pirate theming makes it an enjoyable experience. You may or may not need to ride this, depeding on how much you like thrill rides. One of the best pirate ships I have been on. Not only is it a good ride, but kept in prestin condition! its an ok ride, i dont really ride it much...actually i havent ridden it in years. Wheeee...Uhhhh,...Ohhh...BubbleGuggleGrumble...:puke:...SPLAT! Thats not how my experience went, but any more stuffed with ice cream, it would have been. You HAVE to love the pirate ship! Its just so much fun and just about anyone can enjoy it. Pirate is an excellent, tall swinging ship ride that is a lot of fun! This one gains big points in my book for the efforts the past couple years to theme this ride, and Kennywood has done a great job at doing so. Pirate is now a feature attraction in the wonderful new Volcano Valley area at Kennywood.